The mythical Miura bulls have run yet another year on Sunday over a course jam-packed with runners and they have once again shown their nobleness with making any charges at the runners or threatening them with their horns. The ground was wet and slippery and this made the bulls slip up and fall several times, especially on the Estafeta street stretch. But there were falls all along the length of the course and the Mercaderes stretch produced the most dangerous moments when some of the bulls brushed against the runners with their horns at the fencing on the left side. 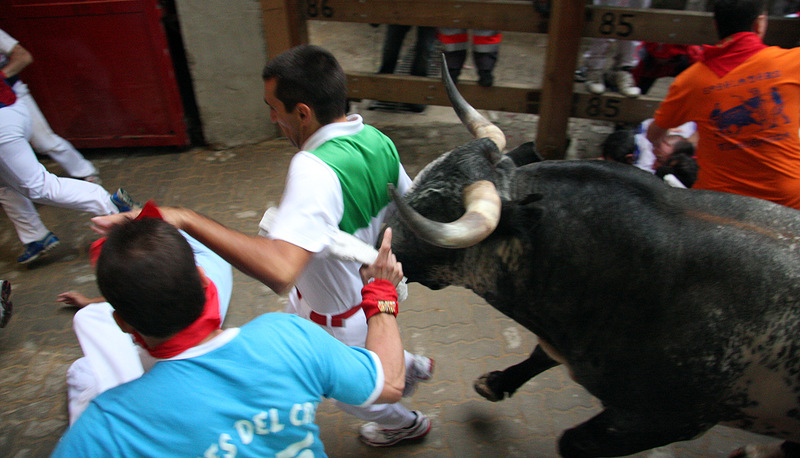 Estafeta was also dangerous with running getting knocked over by the bulls and where the animals were slipping and sliding a lot on the ground. The whole running of the bulls lasted 2 min. 52 sec. Just like yesterday’s running, the more than 800 meters of the course were packed with runners and it was almost difficult at times to see the Miura bulls. The runners had to fight to get a chance of running close in front of the horns. The pack of bulls and bell-oxen came out of the pen in Santo Domingo at a very fast pace and soon some of the bulls were pulling ahead of the bell-oxen and leading the pack along at a rapid pace. The huge number of runners meant that there were a lot of trip-ups and falls all along the course and one runner was badly knocked over on this stretch but it seems that he only suffered a fright. The bulls continued to run close together and on reaching the corner of Mercaderes some of the bulls crashed into the fencing and brushed against the runners there with their horns. One runner got caught between the fencing and several of the bulls, but it seems that he managed to get away with just a scary fright. The pack continued to stay together over a large part of the Estafeta stretch and they ran straight ahead without threatening the runners with their horns. Some small piles of runners were forming from the many trip-ups and falls. The ground was much wetter and more slippery than the previous days and two bulls, a brown-colored one and a violet-colored one, both slipped up twice on this stretch. This meant that the pack was now somewhat stretched out. The runners had to fight and push to try and get space for themselves in front of the horns but yet again there was some nice running close to the horns to be seen on this stretch.